The relationships among growth traits in different ages of 232 heifers Southern Meat Cattle (SMC) breed and genotype and environmental factors were studied using a multifactorial ANOVA, and additionally with a entropy and information analysis (EIA). The traits evaluated were birth weight (BW), weaning weight (WW), weight at year (YW) and weight at 15 (М15), 18 (М18) and 24 months of age (M24). The 21-year period studied (year of heifer’s birth from 1986 to 2006) was classified into three periods as follows: Gen1 – 1986-1992, Gen2 – 1993-1999, Gen3 – 2000-2006. Experimental heifers originated from four sire lines – Ideal 133, Sanil 8, Loksher 302 and Signal 475. Firstly, we tested the hypotheses that weight traits were influenced by the sire line (factor ‘Origin’) and by of heifer’s year of born (factor ‘Generation’). Differences between groups were evaluated with a three-factorial ANOVA (with ages as a repeated measures factor). All statistical analyses were performed using STATISTICA (StatSoft Inc., USA). A repeated measures ANOVA revealed significant main effects for generation, F2; 218 = 15.50; p < 0.001, and age of heifers, F5; 1090 = 2064.91; p < 0.001. Additionally, there was a significant interaction between generation and age of heifers, F10; 1090 = 15.55; p < 0.001 and between generation, origin and age of heifers, F30; 1090 = 1.94; p = 0.002. The lowest entropy values were associated with BW, which did not depend on heifer’s origin and generation (in both cases: p > 0.05). This may be due to the long period (near 20 years) of successful breeding program with the SMC breed. Key words: entropy and information analysis (EIA), growth traits, heifers, beef cattle. Kramarenko, S. S. (2005). Osobennosti ispol’zovaniya entropiyno-informatsionnogo analiza dlya kolichestvennykh priznakov biologicheskikh ob”ektov. zvestiya Samarskogo nauchnogo tsentra Rossiyskoy akademii nauk, 7,1, 242-247 [in Russian]. Kramarenko, A. S., Kuz’micheva, N. I. & Kramarenko, S. S. (2018). Analiz glavnykh komponent rostovykh priznakov yuzhnoy myasnoy porody skota. Stiinta agricola, 1, 126-131 [in Russian]. Kramarenko, S. S., & Lugovoy, S. I. (2013). Ispol’zovanie entropiyno-informatsionnogo analiza dlya otsenki vosproizvoditel’nykh kachestv svinomatok. Vestnik Altayskogo gosudarstvennogo agrarnogo universiteta, 9, 107, 58-62 [in Russian]. Lykhach, V. Ya., Kramarenko, S. S. & Shebanin, P. O. (2015). Vykorystannia entropiino-informatsiinoho analizu dlia otsinky vidtvoriuvalnykh yakostei pomisnykh svynomatok. 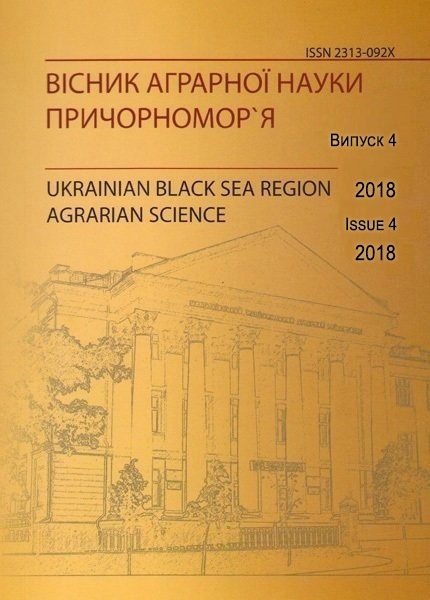 Ukrainian Black Sea region agrarian science, 1 (82), 187-194 [in Ukrainian]. Vdovychenko, Yu. V., Voronenko, V. I. & Naidonova, V. O. et al.(2012). Miasne skotarstvo v stepovii zoni Ukrainy. Nova Kakhovka: PYEL [in Ukrainian]. Khalafyan, A. A. (2007). STATISTICA 6: Statisticheskiy analiz dannykh. Moskva [in Russian]. Patrieva, L. S. & Kramarenko, S. S. (2007). Entropiinyi analiz kilkisnykh oznak dlia selektsiinoi otsinky batkivskoho stada miasnykh kurei. Animal Breeding and Genetics, 41, 149-154 [in Ukrainian]. Pidpala, T. V., Kramarenko, O. S. & Zaitsev Ye. M. (2018). Vykorystannia entropiinoho analizu dlia otsinky rozvytku oznak molochnoi khudoby holshtynskoi porody. Naukovyi visnyk Lvivskoho natsionalnoho universytetu veterynarnoi medytsyny ta biotekhnolohii imeni S. Z. Hzhytskoho, 20, 84, 3-8 [in Ukrainian]. Pidpala, T. V., Kramarenko, S. S. & Bondar S. O. (2016). Zastosuvannia entropiinoho analizu dlia otsinky selektsiinykh oznak molochnoi khudoby. Visnyk Sumskoho natsionalnoho ahrarnoho universytetu, 7, 89-93 [in Ukrainian]. Khvostyk, V. P. (2011). Entropiinyi analiz yakisnykh pokaznykiv yaiets husei stvoriuvanoi dymorfnoi populiatsii / В. П. Хвостик. Naukovyi visnyk Lvivskoho natsionalnoho universytetu veterynarnoi medytsyny ta biotekhnolohii imeni S. Z. Gzhytskoho, 13, 4(50), Ч. 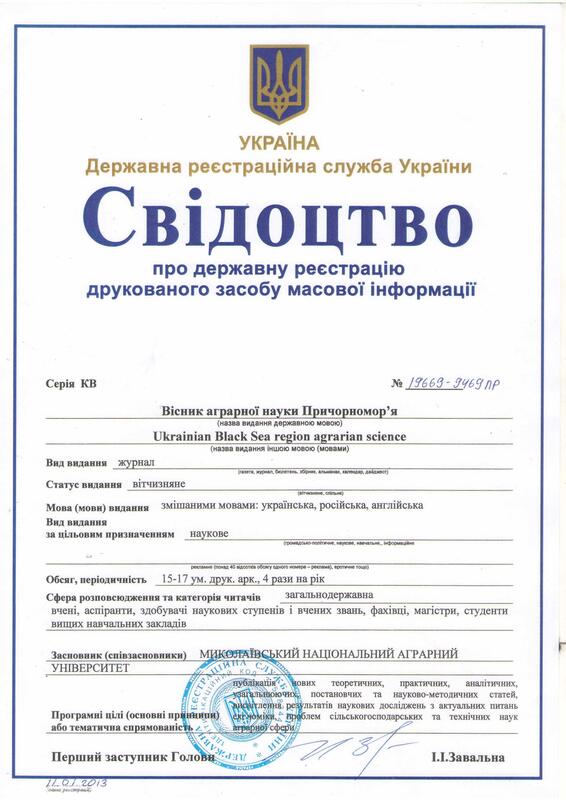 3, 324-327 [in Ukrainian]. Borowska, A., Reyer, H. & Wimmers K. et al. (2016). Detection of SNP effects on feed conversion ratio in pigs based on entropy approach . Acta Fytotechnica et Zootechnica, 19 (3), 103-105. Borowska, A., Reyer, H. & Wimmers K. et al. (2017). Detection of pig genome regions determining production traits using an information theory approach. Livestock Science, 205, 31-35. Bourdon, R. M. & Brinks, J. S. (1982). Genetic, environmental and phenotypic relationships among gestation length, birth weight, growth traits and age at first calving in beef cattle. Journal of Animal Science, 55 (3), 543-553. Dobek, A., Steppa, R. & Molinski, K. et al. (2013). Use of entropy in the analysis of nominal traits in sheep. Journal of applied genetics, 54 (1), 97-102. Gregory, K. E., Cundiff, L. V. & Koch R. M. (1991). Breed effects and heterosis in advanced generations of composite populations for growth traits in both sexes of beef cattle. Journal of animal science, 69 (8), 3202-3212. Holland, M. D. & Odde K. G. (1992). Factors affecting calf birth weight: a review. Theriogenology, 38 (5), 769-798. Souza Dantas Muniz, C. A. D., Queiroz, S A. D. &Mascioli D. S. et al. (2014). Análise de componentes principais para características de crescimento em bovinos de corte. Semina: Ciencias Agrarias, 35 (3), 1569-1576. Pelykh, V. H & Chernyshov, I. V.(2014). Entropiinyi analiz heterohennosti svynomatok riznykh napriamiv produktyvnosti za pokaznykom vyrivnianosti hnizd pid chas narodzhennia. Visnyk ahrarnoi nauky, 2, 36-37 [in Ukrainian]. This entry was posted in , №4(100)2018 and tagged Н. І. Кузьмічова, О. С. Крамаренко, С. С. Крамаренко. Bookmark the permalink. ← S.S.Prorochenko. Root mass accumulation and anti-erosion resistance of soils under meadow grass stands depending on fertilizer.